Earthquake safety experts strongly recommend that people who live in seismically active areas learn what to do before, during and after an earthquake. Although San Diego has not been the epicenter of a strong earthquake in recent history, it is still important to be prepared for one and to make sure everyone in your family knows what to do if the earth starts shaking. The annual Great ShakeOut worldwide earthquake drill will take place at 10:15 a.m. on 10/15 (Oct. 15). You can take part in the preparedness event wherever you are: at home, work, school or in the community. While the earthquake drill can be planned for any day and time of the year, ShakeOut encourages holding one mass drill. Residents, businesses, schools and other organizations can participate simply by going to the ShakeOut.org website and registering. So far, 9.7 million people have registered in California and more than 900,000 have registered in San Diego County. Globally, 6.5 million have registered for ShakeOut. During an earthquake, you need to protect your head from items that might fall in the shaking. Drop, Cover and Hold on until the shaking stops and then be prepared for aftershocks. If you are near a sturdy table or desk, drop to the ground and crawl underneath, then put one hand up to protect your head and use the other to hold onto the furniture in order to keep yourself put in the shaking. If you are not near a table or desk, drop to the ground and move away from any hanging fixtures, windows, glass or furniture that could topple over, and sit up against an interior wall, while covering your head. For more tips on what to do if outside or in a moving car, please read this flier. Although it may seem enough to know what to do, it is important to practice at home with your family so that it becomes second nature. If the response isn’t automatic, some people may become alarmed and forget what they are supposed to do if they are frightened. Hold your own earthquake drill at home with your family or organize one in your office if your employer agrees to it. Remember, your participation in the drill doesn’t have to take place exactly at 10:15 a.m. on 10/15. It can be done before customers enter the building or after closing—that still counts. 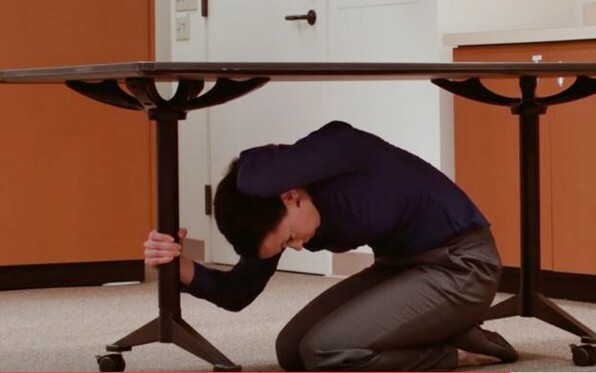 If taking part in the drill would be too disruptive to your office, look around your workspace and figure out where the safest places would be to take shelter in the event of an earthquake. To learn more about how to prepare for an earthquake, visit ReadySanDiego.org and click on the earthquake symbol, or visit ShakeOut.org. Learn how to check your home for hazards, such as items that could topple over onto someone from a high shelf or in a hallway. The goal is to secure breakables with putty or museum wax or rearrange them on a lower shelf, and to secure tall bookcases, televisions, wall art, or hanging mirrors with straps or special hanging hardware to prevent themfrom falling. All of this equipment can be found at most home improvement stores. Create a personalized family disaster plan by taking into consideration medications, special dietary needs for family members such as seniors, infants and pets. You can find a list of emergency supplies on ReadySanDiego.org or in Spanish at ListoSanDiego.org . These items can be stored in case of a major disaster that requires you to survive without assistance for a minimum of three days. After an earthquake, it is important to be ready to seek cover again in the event of an aftershock. Check yourself and others for injuries first. Assuming there are none, someone needs to walk around the home or building and make sure there are no fires which can sometimes ignite after an earthquake from ruptured gas lines. While walking around, be sure to sniff for gas as well. If a gas odor is detected, the main gas line must be turned off. Turn the gas line off only if there is a leak or damage to the line because once it is off, utility crews must turn it back on. If possible, check on neighbors. Visit ShakeOut.org for information on how to hold a drill for schools, businesses, and homes, as well as posters, audio and video resources, and specific safety recommendations for people with disabilities or other access and functional needs.